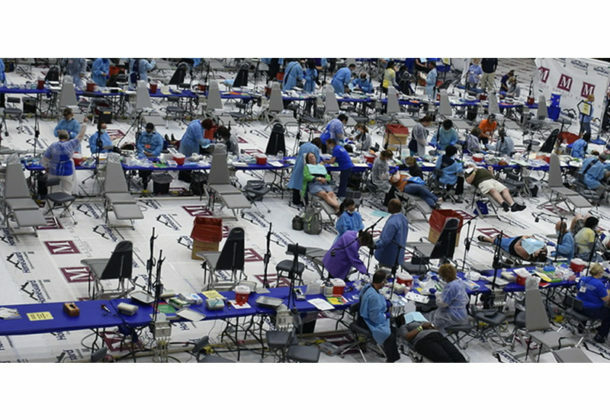 Dental professionals from all over Southern Maryland will come together July 27 and 28, 2018, for the Mission of Mercy dental care event at North Point High School in Waldorf. MedStar St. Mary’s Hospital in Leonardtown is helping to publicize the event. The two-day adult dental clinic is provided by several hundred volunteer dental professionals and volunteer staff. Both days of the clinic will offer preventative dentistry and cleaning, counseling on nutrition, restorative fillings, and extractions for patients 19 and older on a first-come, first-serve basis. Doors open at 6 am each day for patients to get registered, screened, and treated, and will close as the facility fills up with patients at a maximum of 600 per day. Q. What is a “Mission of Mercy” (MOM)? It is a day when volunteer dental professionals and volunteer staff hold free, two-day dental clinics at locations around the country. Q. When did MOM start? In July 2000, the Virginia Dental Health Foundation started the Mission of Mercy Project. The Virginia Commonwealth University School of Dentistry, along with the Virginia Dental Association and the Virginia Health Care Foundation partnered to offer dental care for the uninsured and underserved populations in Virginia. Since then, thousands of patients in more and more states have been served. Virginia and Texas hold multiple events every year. The first Maryland MOM was in Cumberland in 2010. Q. What is an MOM event like? Q. What is the cost of MOM? There is no cost to the patient, no insurance form, nothing. It is free. Q. Who pays for the event? The dental organizations of the hosting state get private donations to cover the entire cost of the event. Donations can come in the form of funds, supplies, meals and/or snacks, chairs and tables, badges, forms, and many other support items. Please consider making a donation. This can vary but cleanings, extractions, fillings, root canals at some locations, some oral surgery, and oral hygiene education. Q. Who is eligible to be treated? Anyone 19 or older. There are not restrictions unless there is a medical reason a patient can’t be treated. Q. What if pain medication or antibiotics are needed? A pharmacy set up at the event will dispense free pain medicine and antibiotics if they are prescribed by the treating dentist. Q. What if a patient needs more treatment? To ensure that all patients have access to follow-up care, arrangements are made with local dentists, if necessary. Q. How does the America’s Dentists Care Foundation play a role? The America’s Dentists Care Foundation is a non-profit group dedicated to maintaining and providing the equipment necessary to put on an MOM event. Also, the group provides the methods for organizing the volunteers it takes to treat hundreds of patients over a two-day span and the expertise to set up, organize, run, and tear-down the event. Q. Can children be treated? No. This clinic does not have child dental services, nor day-care support. Anyone who shows up with children will not be allowed to enter the building. This is an insurance and liability issue over which the local groups have no control.